YouGov CEO, Stephan Shakespeare, takes a look at the recent success of Holland & Barrett. Food retailer Holland & Barrett has been on a health kick recently, increasing its presence on the high street and online while also boosting its profits. In the last year it has opened seven new stores and 42 new franchises as well as expanding overseas. It has fuelled this growth through cultivating its own-brand range and developing its position as a multi-channel retailer. Holland & Barrett is keen to promote itself as a specialist retailer in an increasingly fragmented market, having shaken up its advertising strategy around 18 months ago. Using YouGov’s BrandIndex tool, it is clear that the retailer has been successful in pushing the “high-standards” message. 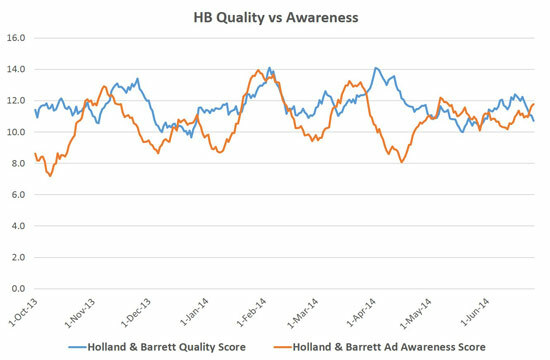 I have compared Holland & Barrett’s ad awareness score, which measures whether a consumer can recall seeing an advert by the brand in the previous two weeks, with its quality score. The two mirror each other, with ad awareness increasing with each advertising burst and perceptions about quality generally rising soon after. BrandIndex also shows that Holland & Barrett has higher quality scores than the UK retail sector as a whole. Since October 2013, the retail sector has an average score of 8.8 while Holland & Barrett has a score of 11.7. By choosing quality, Holland & Barrett has positioned its brand on a virtue that is hard to earn but also hard to forget. The retailer has set out to represent itself as a specialist retailer with an emphasis on quality and it seems to be working. Its recent earnings figures suggest consumers like what they see and its expansion over the past year may just be the start.